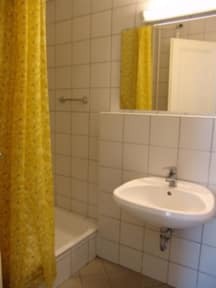 Marco Polo Top Hostel i Budapest, Ungarn: Bestill nå! Cancellation less than 14 days before the arrival or in case of no-show: the penalty is 100% of the total cost. If the number of attendes on arrival or 7 days before the arrival is 10% less than the last rooming list penalty will be charged. In case of cancellation of the whole group: penalty should be paid according to the last rooming list. Located in the heart of the city, this is the perfect youth hostel for anyone visiting Budapest, Hungary. The hostel (member of the IYHF) is also ideal for individual travelers and for large or small groups alike. Everybody can find its preferred room type: single, twin, triple, quad or 12-bedded dormitories. All rooms are non-smoking rooms equipped with fire/smoke detector system! Our twin and quad rooms are bright and comfy and have telephone and TV, plus en-suite bathrooms. Please notice, that our triple rooms are twin rooms + comfortable extra sofa bed! The quad rooms are equipped with two single beds and one bunk-bed! Our dormitories, we've yet to find another anywhere that even comes close. Each spacious 12 bed room is divided into 2-bunk areas with their own lockers. Each dorm has a dedicated bathroom (inside the room) with two sinks, showers and WC's. These rooms are mostly mixed - when we can offer female dorm, you can book it on-line! Please take care of your valuables - use our free safty boxes at the reception. Our lockers ARE NOT security lockers. We cannot take guarantee for your valuables! Thank you! For more information check the 'hostel condition' or contact us! We would be happy to answer to all your question! Nice, clean place, good location, friendly staff, good room except a bit of sewage smell from the bathroom.